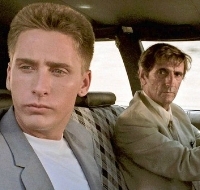 Join Allen and Ryan as they commit crimes* and discuss the 1984 film, Repo Man! We talk about the film’s outrageous antics, and its themes surrounding white suburban punks and radiation research. We also reflect on Harry Dean Stanton’s vast career and discuss some of his most memorable roles.